There’s not just more than one mounting option, but three different ones, all with their own pros and cons. The three mounting options are: outside, inside, and hybrid. An outside mount is good for hiding marred or uninteresting woodwork, as it covers the entire window including frame and trim. An inside mount covers only the window itself leaving the frame and trim visible, so is suitable if you want to show off your frame and trim. 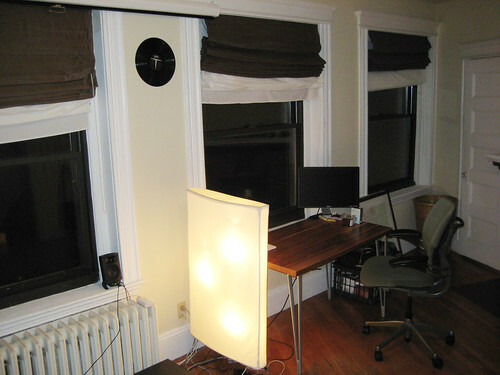 If you have a window with a deep window sill, then the hybrid mount is best. It covers the whole frame horizontally including the top, but ends at the sill. Measuring depends on which mount style, you have chosen. An outside mount requires the distance between the outermost edges of the window trim horizontally and vertically, and the greatest depth of the trim outward from the wall. More often than not, this will be the window sill. An inside mount needs the distance between the inside edges of the trim, again horizontally and vertically, while for a hybrid mount you’ll need to measure the outer edges of the trim horizontally, and from the top edge of the trim to the top of the window sill vertically. The horizontal dimension is always the finished width of the blind, and the vertical dimension is the finished length. This goes for all mount styles. The fabric colour or pattern is entirely up to you, which is the beauty of making your own roman blinds, but knowing how much fabric is needed can be a bit daunting. The so called ‘cut size’ of the fabric is assessed by adding 4 inches (10cm) to the finished width of the blind, and 8½ inches (21.3cm) to the finished length. Most fabric sellers will calculate the needed amount of fabric from this cut size. If you want to calculate it yourself, divide each dimension of the cut size by 36 if using inches and yards, or by 100 if using the metric system. The width of the fabric is usually 54 inches (137cm). However, if your window is wider than 50 inches, you should double the fabric length and simply have a vertical seam in the blind. For sliding doors or wide windows, it’s best to make several separate blinds, rather than one wide one. Roman blinds require a lining, so be sure to purchase the same amount of lining as you did the main fabric. You can choose blackout fabric for your lining, thereby ensuring a darkened room great for restful and undisturbed sleep. You’ll need to hem the front and the lining, then sew them together top and bottom, sewing the wrong sides together. The side edges remain open for now. Then simply sew loop tape to the top edge of the back of the blind. Cut two pieces of twill tape 10 inches (25 cm) smaller than the finished length. Sew one length at each side edge of the blind. If your blind is wider than 39 inches (1 meter), you’ll need three twill tape pieces. Sew one length at each side, and one down the centre of the blind. The bottom ring should be 1 inch (2.5 cm) from the bottom of the blind. Be sure that the first ring of each length is 10 inches (25cm) from the top of the blind, and all bits of tape have an even number of rings. The rings on each tape need to be aligned. Otherwise the blind won’t hang properly and won’t fold properly, either. If you want to have sewn rod pockets, sew a straight line below and above each ring, and then slide a dowel into the pocket. For a no sew, use fabric glue to attach the dowels to the wrong side of the front fabric. A dot of glue every 6 inches (15cm) along the length of the dowel is sufficient. The dowel will need 4 to 12 hours to dry, so lay the dowel on the fabric and keep it in place by weighing it down with books or other reasonably heavy objects, and put a rod inside the bottom hem allowance of the inside-out blind. Once the glue is dry, turn it right-side-out. After you’ve inserted the rods, sew the side seams closed. Before the blind can be remounted, you’ll need to prepare the headrail. Cover the headrail board with muslin or leftover fabric and staple in place on the side that will be facing the wall. Staple the hook tape to the front of the rail, and place a screw eye in the bottom of the rail. Be sure it is even with the ring tapes. If you’re using a cord-lock pulley, mount it on the end of the rail where the finished pull-cord will be. The rail can be mounted to the inside window frame, the upper edge of the trim, or on the wall just above the trim. This is dependent on your chosen mount style. Attach the finished blind to the rail using the hook and loop fasteners. Thread the drapery cord through a screw eye and each ring of tape starting from the top of the blind, and tie it securely to the bottom ring. From the screw eye, pull the length of cord through the pulley and down along the side of the blind. Cut the cord at the wanted length. Repeat with each piece of tape. Then bring the length of cord across to the rail through the first screw eye and the pulley. Cut it, so it is even with the first cord. For a single pull-cord, braid or knot the cords together and add a cord drop. And finally, sit back and admire your handy work. Previous Post How to save a fortune at the Sales?